In 2006 Luxembourg became the first country to make the switch from analogue to digital-only television. Since then, more than 30 countries have followed suit. But while some nations like the United States and Japan are already experiencing television solely as a digital media, the switch to digital television in other countries such as the United Kingdom, Australia and Hong Kong, remain in transition at the time of writing. Considering that many of the countries mentioned here are also some of the world’s largest producers of mass media content (cinematic films, television series etc), this begets an important question: is the future of television inevitably digital-only? In Television as Digital Media, editors James Bennett and Niki Strange believe the answer is a resounding yes. 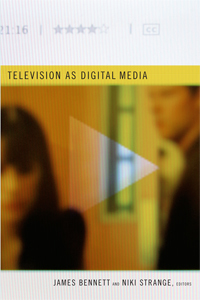 To validate this conviction, Bennett and Strange, together with 11 scholars from Australia, the United Kingdom and the United States, discuss how technological and historical transformations, the textual strategies of producers, the aesthetics of convergence, as well as audience consumption of new media practices have, at both the individual and collective level, compelled digital television towards becoming a staple in modern societies. Yet despite the first clause of the title suggesting that the key premise of the book is about “television”, nothing could be further from the truth. Instead, as Bennett emphasises in the introductory chapter, in the digital age, television needs to be understood as a “non-site-specific, hybrid cultural and technological form” (2). Thus, Television as Digital Media should more correctly be described as a collection of essays dealing with how new technologies, media producers’ push for convergence, and the extent audiences continue to be invited to “participate in communities, share television moments and watch events live” (5), have made it possible for television to be experienced on multiple platforms such as mobile phones, game consoles, iPods, online video services like YouTube, as well as computer-based media players such as Microsoft’s Windows Media Player and Apple TV. To put it differently, the focus of the anthology is not about what digital television is per se, but more geared towards providing “new insights into the emergence of contemporary digital culture” (22). In this sense, Bennett’s introduction, which precedes the 13 essays collected in the volume, not only lays the important theoretical groundwork for understanding the study of digital television, but it also provides an insightful glimpse into what Television has to offer. On that note, there is certainly a lot of rich material provided for the reader’s consideration. For instance, Julian Thomas discusses how the salience of the remote control during the 1970s and 1980s has resulted in a wave of “reactive innovations” (71), which in turn, has come to influence how audiences use and experience (digital) television. Roberta Pearson’s chapter on the development of the Star Trek franchise by contrast, reveals how cult television has helped networks appreciate the importance of niche audiences and narrowcasting, not only for the sake of branding, but also for the networks’ own economic survival. Writing on the subject of preschool television, Jeanette Steemers asserts that broadcasters and producers are increasingly thinking beyond television to attract and engage present-day children who are growing up as “digital natives” (160) adept at using multiple platforms (television, radio, mobile, online etc). Daniel Chamberlain on the other hand, explores the aesthetics of “media interfaces” to underline the extent to which interactive scripted spaces can shape and determine audiences’ experiences and interactions with digital television content. As for Jean Burgess, her focus is on how YouTube operates as a site of community and vernacular creativity, to better expose the “cultural implications of user-generated content” (313), including notions of citizenship. From this short snippet, it is clear that the anthology has tried to address as many key issues as possible. One point of contention, however, is the extensive referencing of materials and case studies from the United States and the United Kingdom, making the book very Anglo-centric and eliding Asia’s experience with digital television. Although Bennett has pointed out that the volume does not seek to discuss what “digital television means in different national contexts” (16), considering that both Japan and Hong Kong stand out as two of the few non-‘western’ countries that have adopted the switch from analogue to digital television, had some attention been paid to how both countries are responding to the digital terrain, the extra Asian perspective would have undoubtedly enhanced the volume’s present value. These imperfections notwithstanding, Television as Digital Media remains a useful source for any scholar keen on learning more about the future of television studies, as well as about the myriad of possibilities available for television in the digital era. But ultimately, it remains much more accessible for readers already pre-armed with some knowledge about the transformations that are currently taking place for television.